Disaster cleanup workers have set up this “tent” above the Gunnison Valley Middle School gymnasium to wick out the moisture in the wooden floor and try to save as much of the floor as possible. School officials estimate it will take one to two weeks to determine the damage. The culprit: Corrosion in pipes and a change in water pressure led to a break at the valve shown, causing flooding at the Gunnison Valley Middle School last week. GUNNISON —A water pipe burst, allowing waters to seep throughout Gunnison Valley Middle School and forcing the first day of school to be cancelled. Much of the gymnasium floor may have to be replaced. 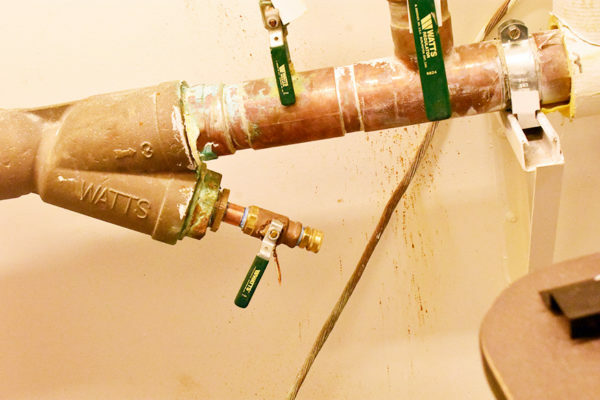 Corrosion, plus a change in pressure, led to a blowout of a valve on a 2-inch water pipe, leaving a 1.5-inch hole, according to South Sanpete School District Superintendent Kent Larsen. That released “a lot of water fast,” the superintendent said. School officials believe the pipe broke sometime on Sunday evening, Aug. 18. The problem was discovered on Monday Aug. 20, the day before school began. Students missed school on Tuesday but were allowed back the next day. The broken valve was located in a utility closet on the east side of the school. 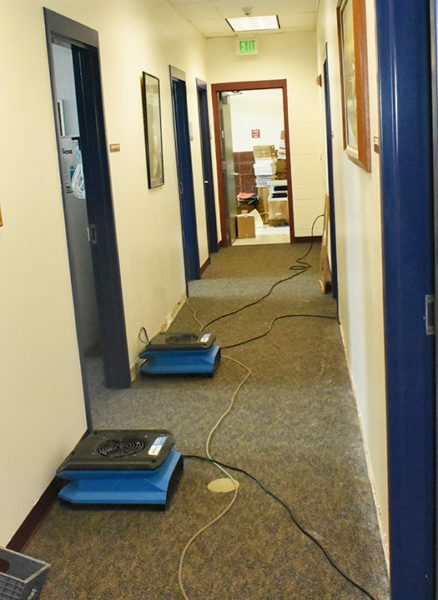 Following the break, there was at least 1 inch of standing water in approximately 70 percent of the building and deeper water in the administration offices on the west side. Gunnison Valley Middle School Principal Jeff Bartholomew said it must be because the school slopes to that side. The worst damage was in the administration offices and the gymnasium. The water that ran into the gym seeped under the floorboards. No one knows how much water got under the boards, but Bartholomew said when the covers to the volleyball net holders were opened, there was standing water in the holes. PowerPlus Cleaning of Fairview and ServPro of Salt Lake City were called to deal with the water damage. 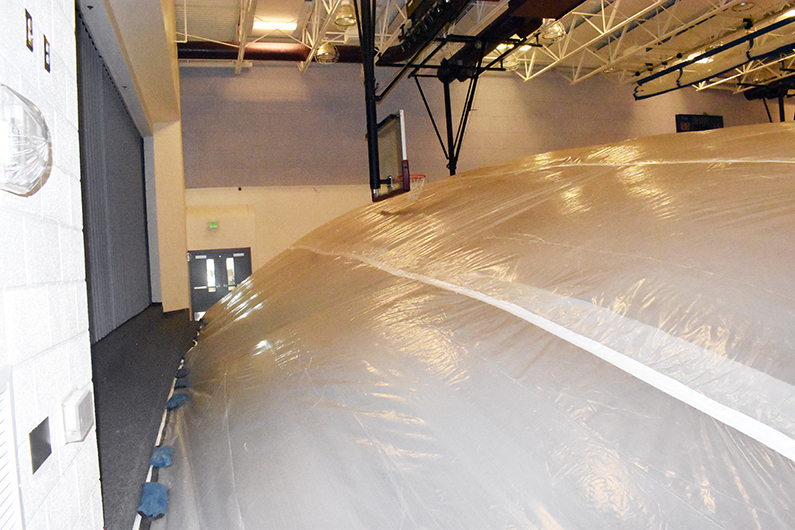 Workers placed fans and de-humidifiers throughout the school and put a tent over the gym floor, which allows air to circulate underneath. After a pipe ruptured last week, fans were set up in a hallway to dry out carpeting in the administrative area at Gunnison Valley Middle School. Bartholomew said it will take one to two weeks to find out how much of the floor will have to be replaced. Once that determination is made, the spoiled wood will have to be torn up, replaced, sanded and refinished. That process will probably take one to two months, he said. Some media outlets estimated the damage to be as much as $20,000, but neither Larsen nor Bartholomew were willing to guess at the amount. “We’ll have to see how much of the wood will have to be replaced before we have any idea,” said Bartholomew. He said all damage would be covered by insurance. The damage to the administrative offices was mostly to the carpet. No other part of the school sustained any significant damage, and there was no lingering smell from moisture. The library did not lose a single book to the flooding, the principal said. Larsen said missed school day will not have to be made up later. The state requires 990 hours of instruction every year, but the school district builds in extra hours throughout the year to account for potential snow days.